In Conversation with Robert YELḰÁTŦE Clifford: On Kinship and W̱SÁNEĆ Relations to Place. Robert Clifford discusses his presentation to Canada's National Energy Board Hearing in November, 2018. The topic of the hearing was centred on the impact of the immanent expansion of oil tankers (400+) moving through Tsawout First Nation traditional territory and the Salish Sea on the coast of British Columbia, Canada. Clifford discusses the wider issues that bear on the harmful impacts of industrialization such as the connections between W̱SÁNEĆ Law, kinship relations and the obligation to protect non-human beings from harm. Conflict Kitchen is a take-out restaurant that only serves cuisine from countries with which the United States is in conflict. 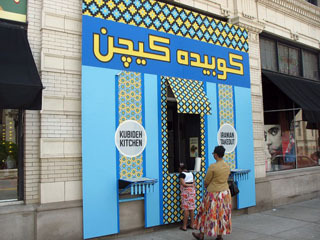 The food is served out of a take-out-style storefront that rotates identities every six months to highlight another country. Each iteration of the project is augmented by events, performances, and discussions that seek to expand the engagement the public has with the culture, politics, and issues at stake within the focus country. These events have included live international Skype dinner parties between citizens of Pittsburgh and young professionals in Tehran, Iran; documentary filmmakers in Kabul, Afghanistan; and community radio activists in Caracas, Venezuela. 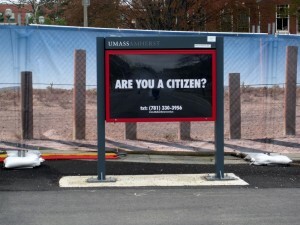 The University of Massechussets Amherst campus had divided its campus by a to-scale photographic replica of the vehicle fence that runs along the international boundary in southern Arizona. The particular stretch of fence being represented was erected in 2007 by Homeland Security and now divides the Tohono O’odham Nation – the second largest Native American reservation in the country – into two parts. What happens when we divide a territory that the community imagines as contiguous? The project was developed by Catherine D’Ignazio of the Institute for Infinitely Small Things. The Autonomous Energy Research Lab is a mobile, human powered research-lab on a bicycle that the artist Jaimes Mayhew uses to collect stories about electricity production. 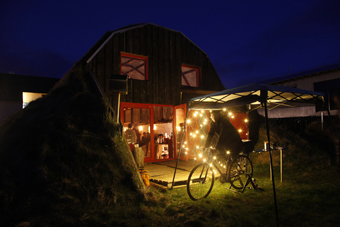 The project is part of a larger art-research project in Iceland that investigates relationships between people, land and energy production and explores conceptions of autonomy as a departure point for investigating and documenting these relationships. The Waffle shop is a neighbourhood restaurant that produces and broadcasts a live streaming talk show with its customers and operates a changeable storytelling billboard on its roof. The shop is a public lab that brings together people from all walks of life to engage in dialogue, experimentation and the co-prodcution of culture. The project functions as an eatery, a TV production studio, a social catalyst, and a business. Our customers are our funders, audience, and participants as we film during open hours, inviting interested patrons to express their unique opinions and personalities. It also runs a Conflict Kitchen than serves food from the countries with whom the United States is in conflict. One vivid memory of the attack on Twin Towers was the loop of video footage that was broadcast on news channels. Watching a simulation of planes repeatedly crashing into the towers was chilling but also comic. The original broadcasts were a twisted combination of slapstick and violence. This video performance by Robin Page (aka Bluebeard) in many ways encapsulates that initial disturbing experience while pointing up the grotesqueness of repetition itself within the filmic medium. Page's piece is not cosy moralising. He does not trot out a party line about the horrors of the event. Instead, his darkly humoured home-video lays bare the perverseness of the act of witnessing what was originally, and is again here, a circular and self-referring event. Putting On is an artists' collective that explores the representation and revolutionary potential of humour in the context of the clown, not only in his age-old role as a masquerading fool, a trickster, a joker and jester but as an aesthetic, social and political metaphor. 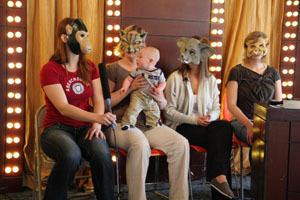 The collective have pursued a range of projects including performing a "Gagged Gag' (as pictured here) at the Circus Charivari in Berlin (2010). They have also published work such as a pirated book for 'And, Press' as part of the publishing house's Piracy Project (2011) and broadcast a radio performance of their 'Manifesto' on Resonance fm (2011).